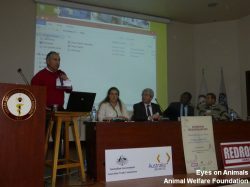 On Monday the 13th and Tuesday the 14th of April, Eyes on Animals and Animal Welfare Foundation organized, together with Redrock and Austrade (Australian Trade Commission) the second animal welfare seminar for slaughter animals in Turkey. 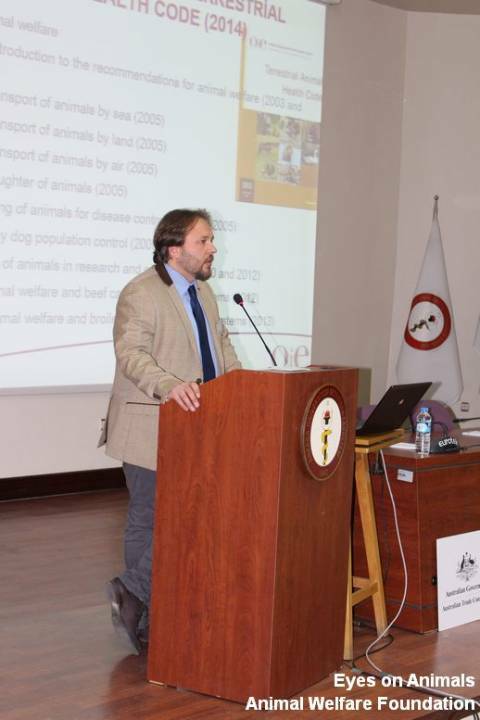 The conference and training on “Improving Animal Welfare and Meat Quality in Turkey” was held at Ankara Veterinary Faculty at Ankara University. The first day was the actual conference whereas the second day was a training day for students, vets, slaughterhouse owners and slaughterhouse workers. Sinan Ögün from Redrock opened the seminar and welcomed all guests and speakers. 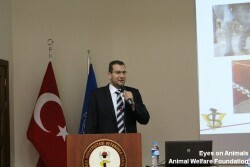 A representative of the Turkish Ministry of Agriculture, who is in charge of animal welfare issues, explained the history and present situation of animal welfare in Turkey. Even the Australian Ambassador Mr. Lino Strangis was there to welcome all guests and support the conference. Prof. Rifki Haziroglu, the dean of Ankara University also held a short welcoming speech and stayed during the conference. We invited many interesting speakers from all over the world. 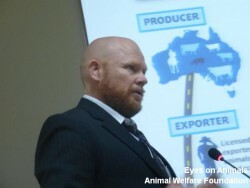 A speaker from Meat and Livestock Australia spoke on Australian exports of livestock to Turkey and the standards Turkish slaughterhouses have to fullfil to be allowed to slaughter Australian livestock. Dr. Kolesar, a very experienced trainer from the OIE, presented the Slaughter Guidelines of the OIE and appropriate restraint systems. 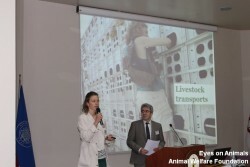 A speaker from V-Cons Belgium explained the influences of good and bad animal welfare conditions during slaughter on meat quality. 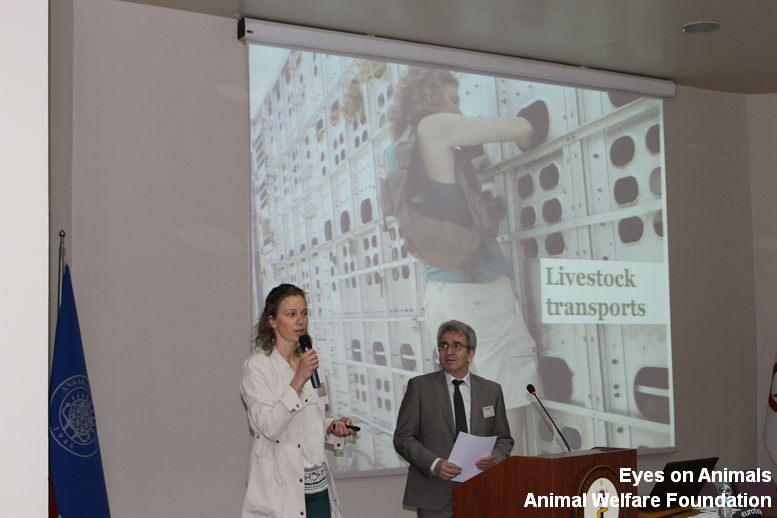 Dr. Wasim Geraisy, a veterinarian from a kosher slaughterhouse in Israel, showed how they deal with unfit animals arriving at the slaughterhouse to reduce unnecessary suffering. Awal Fuseini from the UK Halal Food Authority gave a very lively and inspiring speech on how important animal welfare is in Islam. 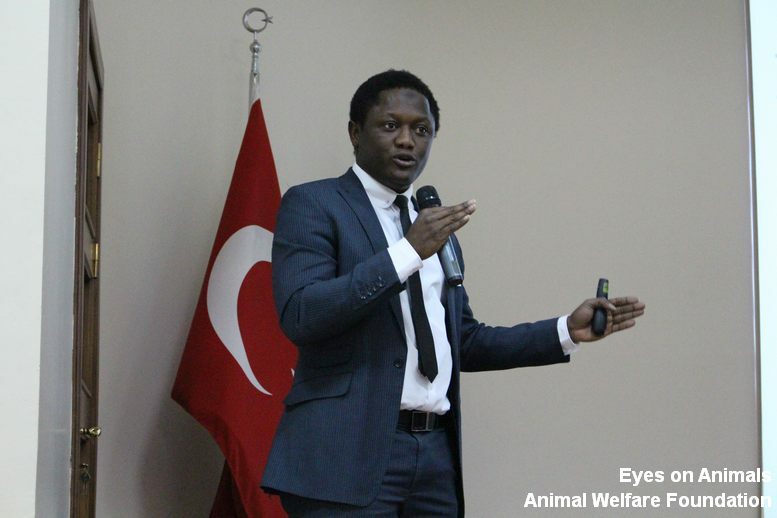 Dr. Eser from the BSI Schwarzenbek gave a short overview on the work of Eyes on Animals, Animal Welfare Foundation and BSI Schwarzenbek in Turkey. Asalet and Lesley from EonA/AWF gave a talk on practical solutions to common problems observed on the ground. The conference day was a big success. 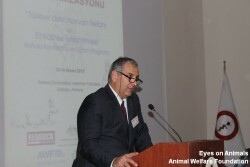 About 100 people attended the conference and contributed with many comments, information and ideas. The second day was our training day. 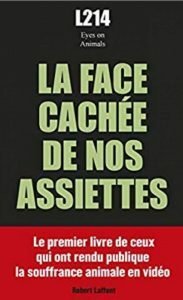 Dr. Geraisy presented how his Israelian slaughterhouse was modernised and he pointed out how important it is to educate the workers regularly. 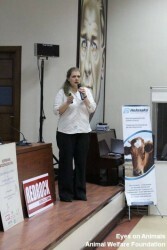 Dr. Fuseini spoke about Halal slaughter in the UK and how the religious rules are carried out in practice. The main part of the day was held by Dr. Eser speaking about critical animal welfare points during slaughter without stunning. 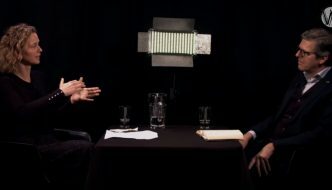 She also went into depth about the science behind electrical and captive bolt stunning. 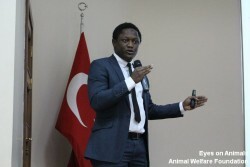 This training was very important so that Turkish people dealing with slaughter issues understand how the stunning methods work and to breakdown some myths, so hopefully one day stunning will be accepted in Turkey. It was great that due to our supporters we were able to hold a second conference after the firstone we had organised in October last year in Istanbul within such a short time. 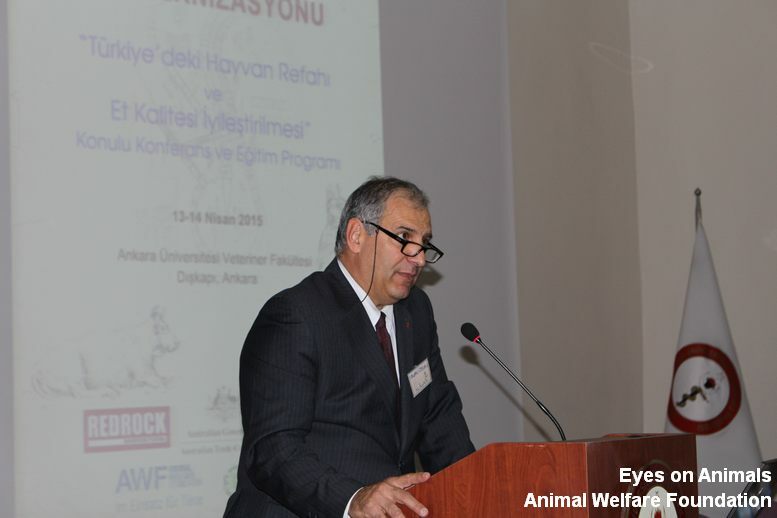 The discussion about animal welfare during slaughter is very lively now in Turkey and also the politicians have to address the issue. We will continue to work hard in Turkey to ensure that the theory is transferred into practice! We feel strongly that Turkey is on the right path!